Chief Minister of Sri Lanka’s Northern Province C.V. Wigneswaran will continue in the post following an understanding with Tamil National Alliance leader R. Sampanthan, days after a large bloc of governing council members withdrew support. On Monday, the Chief Minister agreed to reverse his controversial directive to two provincial ministers that Mr. Sampanthan had earlier objected to. Following negotiations, Mr. Sampanthan told the Northern Province Governor that the Council members would withdraw their motion of no-confidence. “All’s well that ends well,” the TNA veteran said in a letter addressed to the CM. Mr. Sampanthan also called for an early meeting with the CM “to further discuss all issues”. The Tamil leaders had clashed over the CM’s response to a recent inquiry that found two of his cabinet ministers guilty of corruption charges. Apart from urging them to resign, Mr. Wigneswaran asked two other Ministers, who were not found guilty, to go on leave to facilitate further inquiry – a move that Mr. Sampathan found unreasonable and going against natural justice. The CM’s decision provoked as many as 21 members of the 38-member council to withdraw their support to him last week, putting the future of the first council of Sri Lanka’s Northern Province, elected to power in 2013, at stake. 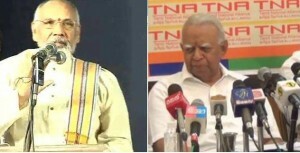 Of the dissenting members, 15 were from the Ilankai Tamil Arasu Katchi (ITAK), the key TNA constituent that both Mr. Sampanthan and Mr. Wigneswaran are members of. After exchanging at least three rounds of letters with Mr. Sampanthan, the CM said he “would not insist on the conditions relating to leave,” at the same time stressing that the ministers should not interfere in a future legal inquiry. While the recent controversy centred on the inquiry, it reflected the simmering disgruntlement within a section of the Council, particularly among ITAK members, who felt neglected. It is yet another manifestation of the widening political differences between Mr. Sampanthan and the CM he hand-picked in 2013. “We have achieved our objective in letting the CM know that most us don’t have confidence in him any more,” an ITAK member in Jaffna said, requesting anonymity. “But we appreciate our Leader’s view that this must be resolved,” he said, allaying rumours of a possible split in the TNA. « Allegations of Corruption Against CV Wgneswaran Will be Brought Into the Open at the Appropriate time” States TNA Jaffna MP Sreetharan.